MidnightIllustration Sketch Blog - The Art of Sam Manley: One more before the New Year! One more before the New Year! This one's a bit of an aside from my regular work - I am Chairman of the Ludlow Art Society, a wonderful society that, this year, celebrated its 70th anniversary. 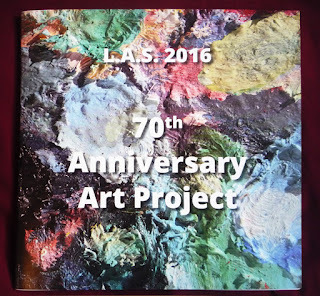 As it was such a special event, the LAS's Committee decided early on in the year to invite members to submit original work on a sheet of heavy paper we sent out to them, so that we could collect these, along with a short paragraph about and a portrait picture of, each of the artists who chose to take part. After a preview of the book during our annual Summer Exhibition, we collected the final details, got everything scanned, assembled into book form, and the books were ready just in time for Christmas. Local multi-talented artist and Committee Member Samuel Bebb did a fantastic job leading the project, collecting and organising the details and defining the overall layout. I feel it's important to mark events like this, to take a snapshot of what the Ludlow Art Society looks like, what the makeup of it is, and just how wonderfully diverse our artistic interests are. The book contains a brief history of the Society, written back in 1993 by the late LAS Vice President Winifred Burlingham, one of the founding members - this gives a firm sense of why we came to be, and shows that, despite the many changes the LAS has gone through over the decades, exhibiting and demonstrations were then, as now, at the core of the Society. The book also features a thoughtful foreword by current President, Charles MacCarthy, and opens with a few lines I wrote, which I hope can stand next to the rest of the introduction.